We use a digital x-ray unit, which allows us to deliver high quality results with minimal radiation exposure for your pet. Radiology (or x-ray) is a crucial tool in veterinary medicine, as our pets often have underlying disease that is not evident on the outside. This technology allows our veterinarians to rapidly and accurately evaluate musculoskeletal, cardiovascular/cardiopulmonary (heart and lungs), gastrointestinal, reproductive and urinary systems. We have complete in house laboratory testing capabilities including hematology, serum chemistries, thyroid levels, urinalysis, and electrolytes. 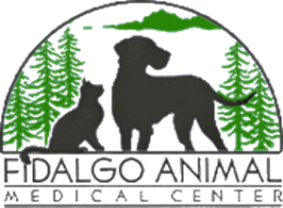 This allows us to screen patients prior to anesthesia, rapidly diagnose disease in sick pets, and run emergency blood work. Many times you will have your pet's test results before leaving the clinic. We also partner with reference laboratories and universities, to offer a broad range of diagnostic testing. Our doctors can perform routine pathology to check for infection, and evaluate growths and wounds. We also have the skilled staff and equipment for ECG (electrocardiogram), doppler blood pressures, tonometry (intra-ocular/eye pressures), and pulse oximetry (oxygen blood levels).